CHILDREN'S ILLUSTRATION: The Robots Are Back! And this time they have gas. Annette Simon's minimalist robots from Robot Zombie Frankenstein! return—counting, belching and shouting the alphabet. Theatrical readers who can thrown themselves wholeheartedly into burping and singing ("a-zoink-zoink-here-and-a-zoink-zoink-there") will make this picture book a hit with a preschool audience. 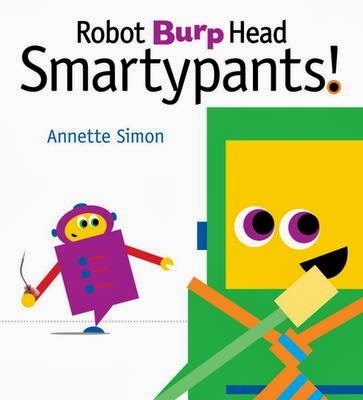 Simon's colorful graphic design (reminiscent of Colorforms) make the pages of Robot Burp Head Smartypants! stylish and lively. Download a SMARTYPANTS activity kit here.